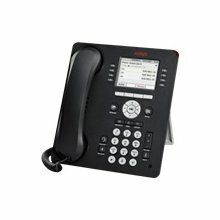 The Avaya 9611G IP Deskphone offers a Color Display, Full Duplex Speakerphone, and Gigabit Ethernet, making it perfect for most phone users. The 9611G also offers 8 buttons with dual LEDs (green, red), 4 softkeys, 24 administrative buttons and up to 8 lines displayed simutaneously, and two message waiting indicators. Compatible with Avaya Aura Communication Manager 3.1.4 and greater (H.323). Also Avaya Aura Communication Manager 6.0 with Avaya Aura Session Manager 6.0 or Avaya Midsize Business Template 5.2.1 (SIP).